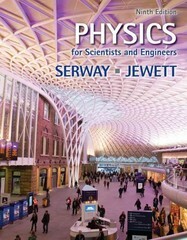 Physics for Scientists and Engineers 9 Edition Achieve success in your physics course by making the most of what PHYSICS FOR SCIENTISTS AND ENGINEERS has to offer. From a host of in-text features to a range of outstanding technology resources, you'll have everything you need to understand the natural forces and principles of physics. Throughout every chapter, the authors have built in a wide range of examples, exercises, and illustrations that will help you understand the laws of physics AND succeed in your course!